In 1944, Eleanor Estes and Louis Slobodkin joined together to create an extraordinary book. 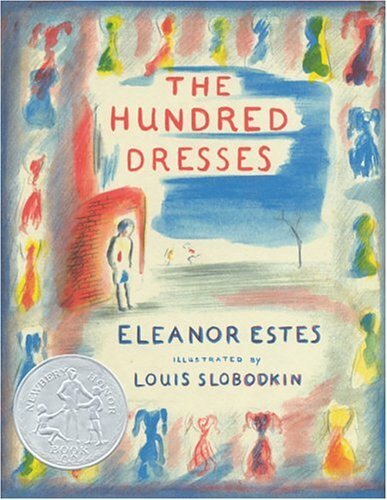 The Hundred Dresses is one of those rare children’s books that stays with you, long after you have turned the last page. Granted, it is a difficult book, dealing with the topic of bullying, but the beauty and poetic sensitivity of this book have made it a classic for these last 67 years. The Hundred Dresses tells the tale of Wanda Petronski, a poor Polish-American girl, who is teased at school for her accent, her shabby clothes and her hard-to-pronounce last name. Wanda bears the brunt of her bullying with poise and grace. That is, until, one of the girls in her class makes fun of her faded blue dress which she seems to wear to school every day. Wanda, in a moment of defiance and brilliance, tells the other girls that this is just one of a hundred dresses that she has at home. And she describes her dresses, and their beautiful fabrics, their vivid colors with such detail and such imagination that the other girls, knowing it has to be a lie, begin to bully her all the more ruthlessly – asking her daily about her hundred dresses back home. When Wanda’s family decides to leave the town and move to another school due to the torment their child is experiencing, one little girl experiences the guilt and shame associated with her role in this decision. And when she, and the others, actually come to see Wanda’s hundred dresses with their own eyes, the outcome is touching, tragic, and ultimately beautiful. This book has stayed with me all of these years not only for its rich, abundant prose and gorgeous illustrations, but for the universal themes of ridicule and its outcomes. This is an important book – and one that all parents should share at some point with their children. To teach them that everyone, no matter their color, class or accent has a hundred beautiful dresses of their own just waiting to be seen.